All Dogs Are Blue by Rodrigo de Souza Leão (translated by Zoë Perry and Stefan Tobler, e-copy courtesy of the publisher) is a semi-autobiographical tale of time spent inside a mental institute. An overweight schizophrenic is locked up after trashing his parents’ house, and in a confusing stream-of-consciousness monologue, we learn a little about how he’s ended up there and a lot about what happens within the asylum’s walls. Our friend is a little bit paranoid and obsessed by the idea that he swallowed a chip (which may have developed from the cricket he swallowed when he was a child). There’s a lot more to his madness than that though. 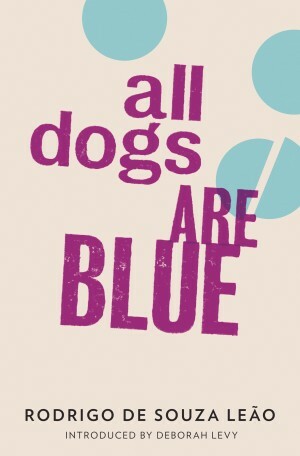 All Dogs are Blue, as mentioned in my introduction, is a work you race through, a real one-sitting book. It’s a story which gives you a flavour of Brazil, albeit in small glimpses through the bars on the institute’s windows, but it’s also a slightly unsettling glimpse into the writer’s own problems. It fits in very well with the rest of And Other Stories’ back catalogue – edgy and ever-so-slightly bizarre. This sounds like quite a heartbreaking read, especially in light of the author's biography. An interesting alternative view of Brazil, perhaps. I can never resist anything from or about that country. Thanks for adding to my reading list yet again! Madness, religion and Brazil. What could be wrong with this? No football though, or is there? Marina Sofia – No worries 🙂 A new one for me too (I can't remember having read anything from Brazil, even though I couldn't really believe that when I realised…). Stu – A bit bizarre, but (as I said) it fits in well with other And Other Stories publications. I read this book a few days ago and was impressed. Though it deals well with serious themes, it isn't a heavy read but an enjoyable and fast one. Maybe more strange than fun, but enjoyable all the same.